Greenway Carriers, LLC was founded in 2009. We started in Lufkin, Texas with just one truck and trailer working for other carriers. Our company made the decision to expand its operations as a carrier servicing the Contiguous United States. 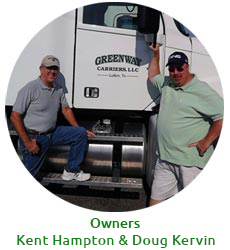 In 2012 and 2013 Greenway Carriers, LLC embraced the future and began to update and modernize its fleet allowing expansion into additional geographic areas, offering additional lane options for our customers. Today Greenway Carriers, LLC has one of the largest dry box fleets in our area with the ability to offer exceptional service to our customers. To see where we stand today, browse to our Services page. Click the Online Application link or call us. Have a shipment you need to move right now? We’re standing by to assist you in getting it there in an efficient and timely manner. Simply fill out our online form and we’ll have your quote ready as quickly as possible.